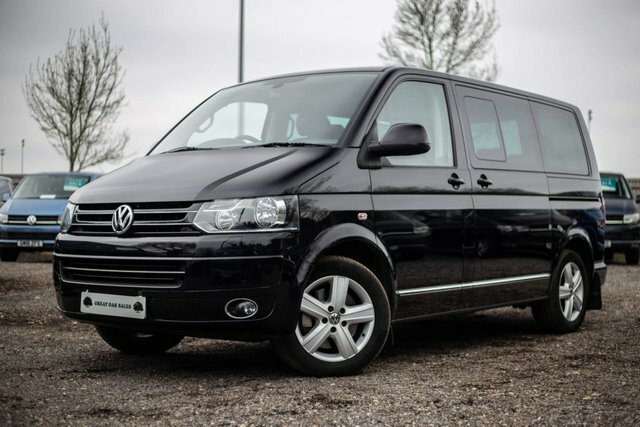 This is a Short wheelbase Caravelle Executive (T5) in Black. The vehicle comes with Kenwood Head Unit, Front & Rear Parking Sensors, Leather upholstery, Carpeted throughout, Multi Function Steering Wheel, Zonal Air Con, Twin Electric Sliding Doors, Alloy Wheels, Centre Table, 7 Seats, Privacy Blinds. 12 Month Warranty & Breakdown Cover. Part service history, a new engine has been fitted by VW a year ago at 92,458 miles.